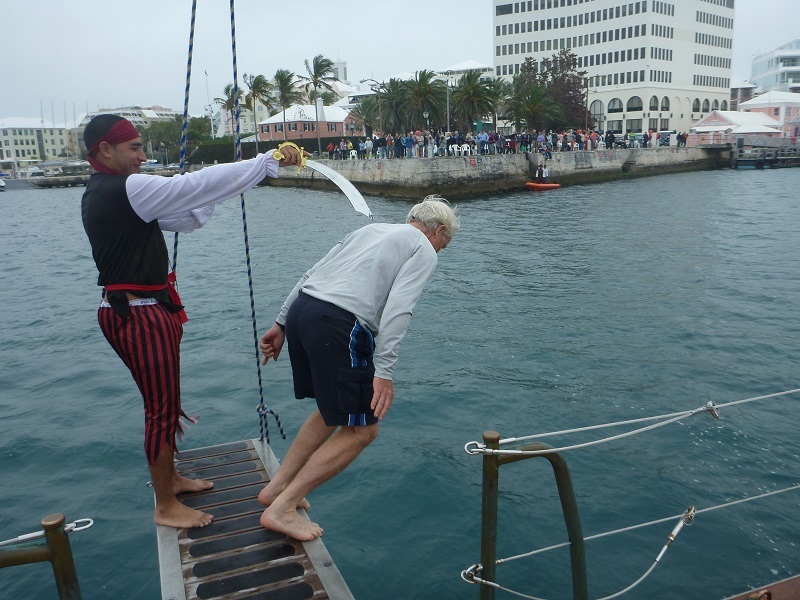 Over $100,000 was raised during yesterday’s [Apr 6] Pirates of Bermuda fundraiser, which saw well known locals ‘walk the plank’ in an effort to support the Bermuda Sloop Foundation’s ‘Save the Spirit’ campaign. Governor George Fergusson gave his “Letter of Marque” granting permission for the Foundation to take hostages, and the Governor and the Sloop Foundation CEO Denise Riviere called off the fate of each hostage based on the amount of money raised. Ms Riviere said, “There were 24 hostages, 22 in attendance, only 1 of which was successful in maintaining her ransom and getting off the ship dry. The crowd was an impressive size filled of community members and tourists of all ages. 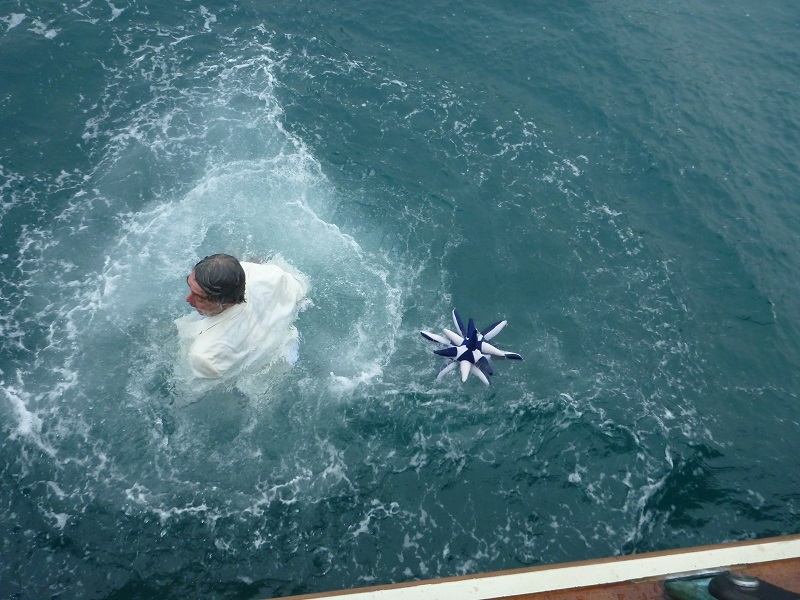 “With each splash, the spectators watched with great excitement as Spirit of Bermuda anchored just off Albouy’s Point with the crew dressed in pirates uniforms. “Despite many hostages attempts to try to raise enough ransom to stay dry, family, friends and colleagues promptly put up the money needed just in time to watch their love ones walk the plank. It was great fun, but the water was cold! “We have not tallied everything yet, but we certainly raised over $100,000. This was a great milestone in our current $3 million Save Spirit of Bermuda Campaign intended to save our Character Development Programme, which mostly serves M3 level students,” concluded Ms Riviere. 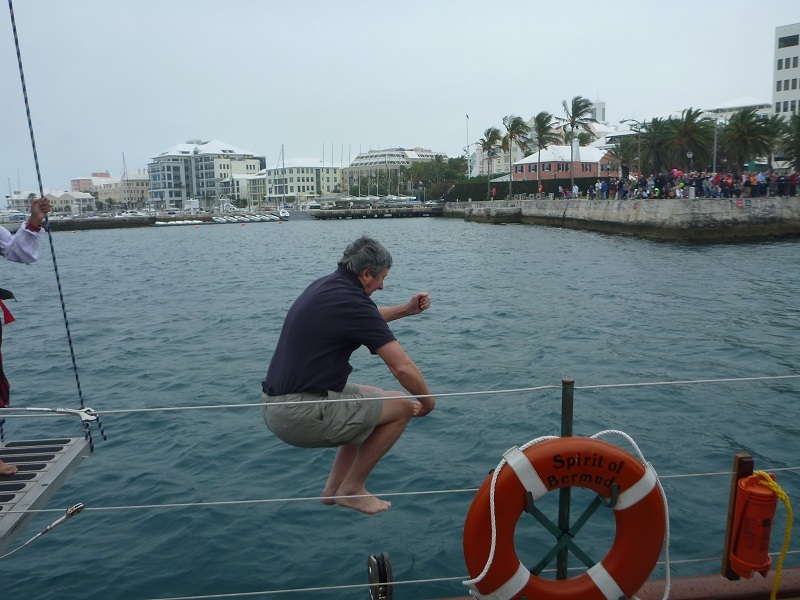 Launched in 2006 and operated by the Bermuda Sloop Foundation, the “Spirit of Bermuda” is an educational vessel intended to introduce young Bermudians to the island’s maritime heritage. The Spirit of Bermuda is based on civilian Bermudian-type schooners built in Bermuda between 1810 and 1840, and has provided training for thousands of young people, sailing to over 15 ports in 10 countries. Best youth programme in Bermuda. Go SPIRIT! That’s quite an unfair statement to make. The last time I checked, football certainly involved teamwork and high fitness along with commitment and discipline. Something that can be said about most sports, including sailing. There are many things that can teach you useful qualities in life, so keep the ignorance on pause. This event looked great with results to match. People use Bernews far to often to make negative comments even on POSITIVE stories. Don’t try to underplay the value of other sports. $3 million would go a long way for traditional sports. I would dare to say that per dollar the other sports are much more efficient at teaching life skills to our children.